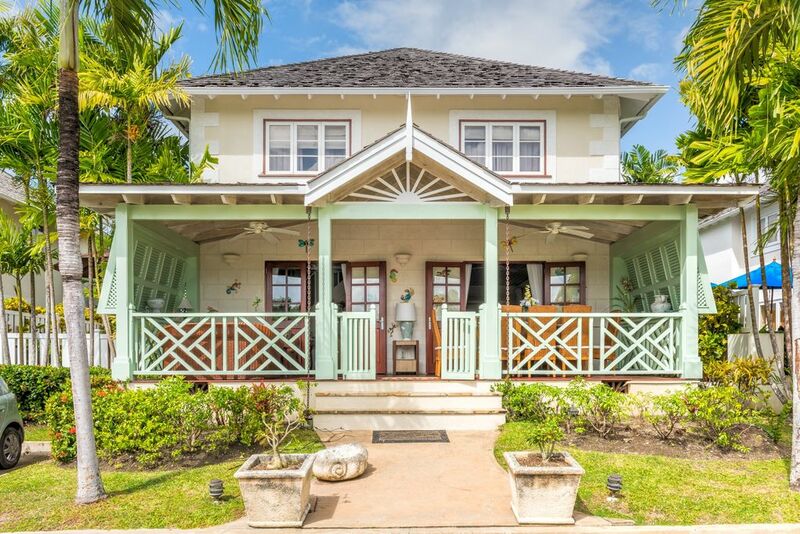 Maison de vacances accueillante pour les familles, à proximité de la plage et de Holetown. Pavilion Grove est un développement exclusif, fermé de six villas individuelles, chacune avec leur propre piscine privée entourée de jardins magnifiquement paysagers. Situé à quelques minutes à pied des plages de l'hôtel Glitter Bay et de l'hôtel Fairmont Royal Pavilion, sur la fabuleuse côte ouest de la Barbade, dans la paroisse St James. No 3 Pavilion Grove offre environ 2.000 pieds carrés d'espace de vie, entièrement climatisé et meublé avec goût. La villa dispose d'une chambre au rez-de-chaussée et les 3 autres chambres à l'étage. Toutes les chambres sont climatisées avec des ventilateurs de plafond. Elles sont équipées d'un sèche-cheveux et d'une salle de bains privative, à l'exception de la chambre du rez-de-chaussée pour laquelle la salle de bains est située à côté. La chambre principale a un lit king size et un futon double qui peut accueillir deux personnes. Il a une grande salle de douche. Les deuxième et troisième chambres ont des lits doubles et des salles d'eau. La quatrième chambre est en bas et a des lits jumeaux, la salle de bain est à côté. Spent one week in this comfortable house with our family of 6 plus a baby and it offered a walk to the beach, convenient to Holetown and all the conveniences of home. Hated to leave! I just returned from Barbados about two weeks ago and i must say I fell in love. I am still talking about this house and how amazing it was. It was 6 females and we all know females take a long time but having 4 full bathrooms was absolutely what we needed to get us up and out the house. The bedrooms were so comfy and spacious each room had an ac and a closet which was great to organize our clothing. Kitchen had everything we needed and there was more than enough dining space. The pool was small but that’s all we needed to refresh from the bajan sun. Of course the location was also a plus. The house is located across the street from the Fairview Pavillion hotel which was so convinient as a land mark and also for a nice beach day or night. We had dinner at jujus shack about a 5 minute walk away it’s hidden so ask around. It has great local food and flying fish, and an amazing view to end your day. Also we didn’t take a cab to get around we hopped right on the bus which cost $1 or $2 we went to different towns just on the bus alone. It was great such a small island you literally cannot get lost. The bus runs up and down the road right outside the house. Also we booked an excursion and we told them that we were staying at the Fairmont Pavillion and the hotel had no problem letting us go into the lobby and wait for our van to pick us up. Definitely a plus. The locals were very helpful directing our way around Bridgetown and back to Holetown. This house is also located in small gated community which gives you comfort knowing that only people with a key can come inside. I would definitely come back and wouldn’t hesitate to stay here again. Thank you to Jacintha that was also very helpful with everything! Delighted you enjoyed your stay. It's really important to us that our guests have the very best experience. Come back soon! The desert rose was perfectly suited for our visit to Barbados. We were a short drive to a beachfront marine sanctuary for swimming and snorkeling. There was easy provisioning at Massey's in Holetown as well as good restaurants and bars to relax for sunsets. We found fresh seafood at Millie's fish market in Speightstown. The Villa was very well equipped and we made great use of the grill, the patio and the plunge pool on a daily basis. Dinners on the porch were quite enjoyable and the frog chorus was great background to our evenings at the villa. I would enjoy another stay at the Villa and hope to return again soon! We would be delighted to welcome you back to Desert Rose. So pleased you enjoyed your time there and in Barbados. Come back soon! Amazing luxury villa in the heart of St. James, Barbados! We had such friendly welcome and the host even stocked the fridge with Banks' Beers for us! The villa was located at a perfect spot, moments from Holetown and the Rum Shacks! We walked down the beach everyday (2 mins) and had lunch at the famous JuJu's as well as having meals at the Lone Star which was literally a stones throw away! The Andrews family had a wonderful time and we will certainly be back for the most perfect location and villa in St. James!